Jon Gruden has been vindicated. So says MIT, which gave the Oakland Raiders and their supposedly Luddite head coach an award for the Khalil Mack trade to the Chicago Bears last year. At the time, the deal was widely panned from Oakland’s perspective by much of the football literati, most of whom are quite friendly with the concept of using analytic data to properly execute value in trades involving draft picks. So have those folks come around? We’re guessing there’s still cynicism for the wisdom of trading an elite established pass rusher who is still very much in the prime of his career. And that’s part of what makes this debate fascinating. The 2019 Sloan Sports Analytics Conference might have changed the view of things. And might Gruden have been playing possum with his anti-analytics rant at the NFL scouting combine last year? It was a rant that Gruden appeared to invite when he spoke about “taking the game back to 1998,” droning on about “GPS” data and eschewing the analytic approach that many progressive teams had endorsed for team-building methods in the modern NFL since Gruden had last coached. It’s hard to know what Gruden does and does not endorse when it comes to this specific element of analytics, in terms of player and draft-pick trades anyway. After all, the Mack deal hurt his team in the short term — the Raiders had 17 fewer sacks than any other NFL squad last year — and other trades (such as Martavis Bryant) appeared to be that of a franchise that did not value its draft-pick assets. Let’s first say that the MIT folks are likely a whole lot smarter than me. After all, I’m the product of a state school, earning only a bachelor’s degree. But if those analysts are going to praise the trade the way they did, shouldn’t they at least have waited until it had been fully completed? After all, the Raiders have yet to use any of the draft picks they’ve received in return for Mack. If making a full judgment on an NFL prospect takes, let’s say, three years, it might behoove us to wait until at least 2023 to stamp an ironclad winner or loser on the deal. After all, the Raiders still get picks from the Bears in next year’s draft, including their first-rounder. And yes, we understand what the Sloan Sports Conference was doing here. It was saying that the real value is in getting the picks, and if the Raiders go on to draft a busload full of busts, well, that’s not Sloan’s fault. Isn’t this a Cleveland Browns debate too? There is a direct line between what we’re debating with the Raiders and what unfolded the past few years in Cleveland. After all, former Browns executive Sashi Brown unleashed a bold, vast plan to accumulate as many assets — in the form of draft picks — as possible. Now that plan is coming to life as the Browns enter 2019 as one of the NFL’s most exciting and talented teams. But poor Sashi, the apple of the NFL analytics contingent’s eyes, is out of a job there and new general manager John Dorsey is the one spending all of the draft picks that Brown had accumulated. The circumstances in Oakland are different, with Gruden enacting his deals after taking over, but the point remains: How much credit do we give Brown for the Browns’ revival? After all, he’s the one who loaded the chamber with ammunition, even if someone else pulled the trigger. And taking it a step further with the Raiders in mind ... how much weight did Gruden place in his analytics people (yes, the Raiders have them) and how much of it was a stubbornness in not wanting to pay Mack? That’s a question only Gruden can answer — and it likely would require a hearty dose of truth serum to get a clear response. Gruden is the Raiders’ grand poo-bah. Every major personnel decision is run through him. Yes, the Raiders now have a general manager, but we all know Mike Mayock doesn’t wield the power to go rogue on these kinds of calls. One of those two men has a 10-year, $100 million contract, and — spoiler — it’s not Mayock. But that’s not to undersell his involvement. The two reportedly are thick as thieves so far, fitting hand in glove, Mayock told NBC’s Peter King this week, and we have to assume Gruden is letting his personnel head do his job effectively even with certain understandable limitations. There also are the unknown contributions of Dave Razzano, the team’s vaguely titled director of football research, along with director of football analytics David Christoff. (Funny enough, guess where Christoff got his degree from ... yup, MIT.) 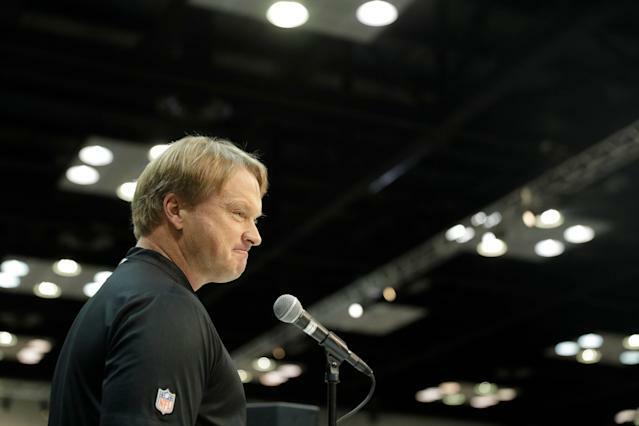 How much did Gruden weigh each of their input before making the Mack trade? That’s likely impossible to tell, but it’s worth noting that many inside the building felt at the time that the tipping point for former GM Reggie McKenzie’s eventual ouster was that trade, when McKenzie reportedly was a bit out of the loop on the deal at first and Razzano was the one doing the initial work on it. McKenzie was out of the job a few months later around Week 14. But whoever gets credit for the trade other than Gruden is now pushed to the side. If Gruden and his army of personnel folks don’t nail the picks they’ve landed for the Mack and Amari Cooper trades, it will all be for naught. Oakland currently has four picks in the top 35 selections overall, including three first-round selections (Nos. 4, 24 and 27). The Bears and Dallas Cowboys made the playoffs which hurt the Raiders’ draft positioning, but they can thank their own 4-12 campaign for putting them in the catbird’s seat at No. 4. Again, we likely won’t be able to stamp any kind of finality on this deal, even though both sides now have strong views on it, for many years. We also know that won’t stop people from picking a side. If you were anti-Gruden before, it’s unclear how much the Sloan award changes that negative view; and if you were always pro-Chucky, well, you might be borderline insufferable now celebrating the deal’s visionary genius, supported by the smart math community. Just do us one solid, will you please? Maybe wait to see which players they end up picking before you close the door on this puppy, OK? Please and thanks in advance.